Usually it’s the dog that wants in, and Turbo takes exactly the same dramatic pose when it’s dinnertime and the door is between her and her food bowl. 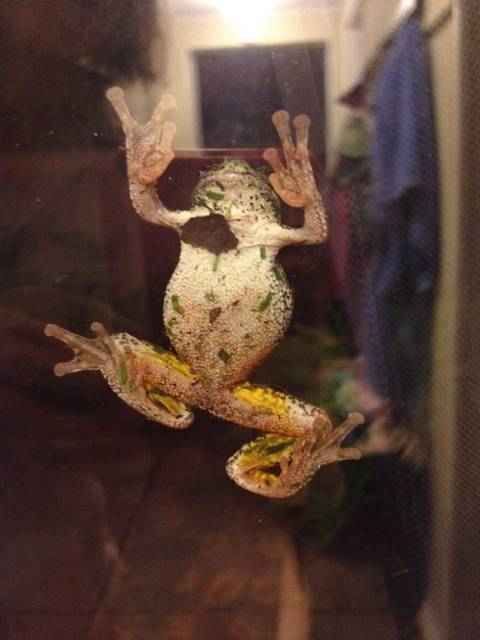 Mr. Tree Frog seems to have caught a moth between the door glass and his body, what’s he going to do – crush it to death? He seems to be looking for food and for love, and not in that order. There are 3 or 4 of them outside in the garden, all making quite a racket. A lovely, summertime, racket. Learn more about Gray Tree Frogs at Ontario Nature.